This variation is shown in 'reeded' tubing with added arm. Enjoy class and elegance with this 5 arm 5 light Victorian Style gaslight reproduction fixture with historical acid etched gas shades. 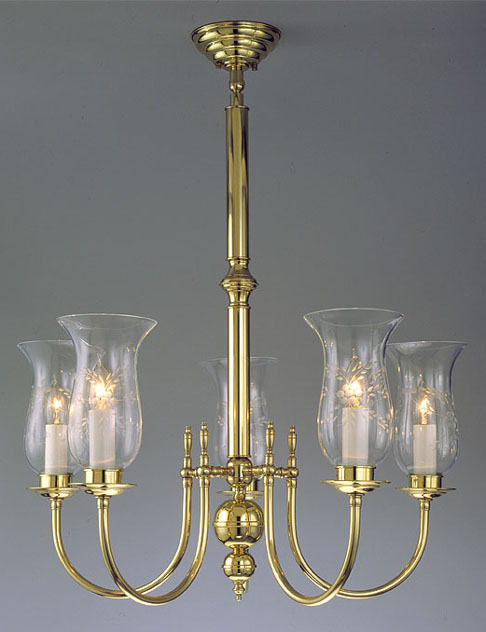 Reeded, variable width tubing all around and realistic gas keys add a very nice touch to this gas light reproduction. Shown in Satin Brass. Available in different Metal Finishes, different Glass, Back Plate, more or fewer arms, arm direction, tubing style and many other Custom Options.